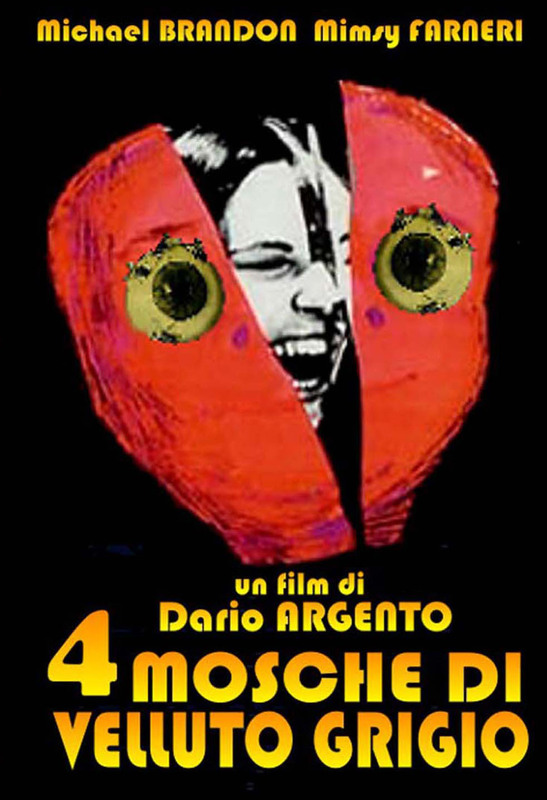 Four Flies on Grey Velvet is the final in Dario Argento’s Animal trilogy, the previous two being The Bird with the Crystal Plumage and The Cat o’ Nine Tails. The film is named after the four flies imprinted in the retina of one of the victims. The film follows Roberto Tobias (Michael Brandon) a drummer in a rock band who, after being stalked by mysterious stranger accidently stabs and kills the man. Whilst this isn’t bad enough, the act is captured on camera by a second (masked) stranger. It soon becomes obvious that the masked man doesn’t want to take the incriminating photos to the police, rather torture and blackmail Roberto and his wife, Nina (Mimsy Farmer). Roberto cannot turn to the police (after committing murder) and instead confides in God (short for Godfrey) played by Bud Spencer, a hermit-like figure who lives in a shack by the river with a parrot called Jerkoff and an eccentric layabout referred to as ‘The Professor’ played by Oreste Lionello. On the recommendation of God, Roberto hires a private investigator, Gianni Arrosio (Jean Pierre Marielle) who has never yet solved a case. Unfortunately for Arrosio this case breaks his unlucky streak but the killer catches up with him before he can tell anyone. The film climaxes in Roberto confronting the killer after waiting for the killer in his darkened house, this scene is possibly the first instance of high-speed camera equipment being used to follow the trajectory of a bullet. Everything in the film is used to increase the tension. There are long sequences where a camera follows a single character in silence, spinning and panning around them, disorientating the viewer. The film is full of disappearing crowds where one minute normal life is going on only to be deserted the next second creating an isolated and ominous feeling. Unlike many films when filming at night there is no extra ‘movie’ ambience light, leaving the viewer straining to see what is going on. In contrast to the dark night scenes are Roberto’s dream sequences which fill the screen with white light which gradually fades to reveal an execution. Despite taking itself seriously there are a number of slightly bizarre scenes and touches, the aforementioned Jerkoff and a meeting between God, the Professor and Roberto in a funeral convention featuring a lot of very odd looking coffins. The lightness of these scenes serve to keep the film from becoming too bogged down. Four Flies on Grey Velvet is a fine example of the Giallo genre, an Italian genre of suspense thriller/horror films from the 1960s and 70s. Despite the far-fetched science that lends the film its name, it is a blemish in a believable (if very 70s) film that keeps you on the edge of your seat and guessing until the very end. I would recommend this film to anyone and it has encouraged me to watch/re-watch more of both Argento’s films and films in the Giallo genre.